Introduced in GitLab Ultimate 10.2. 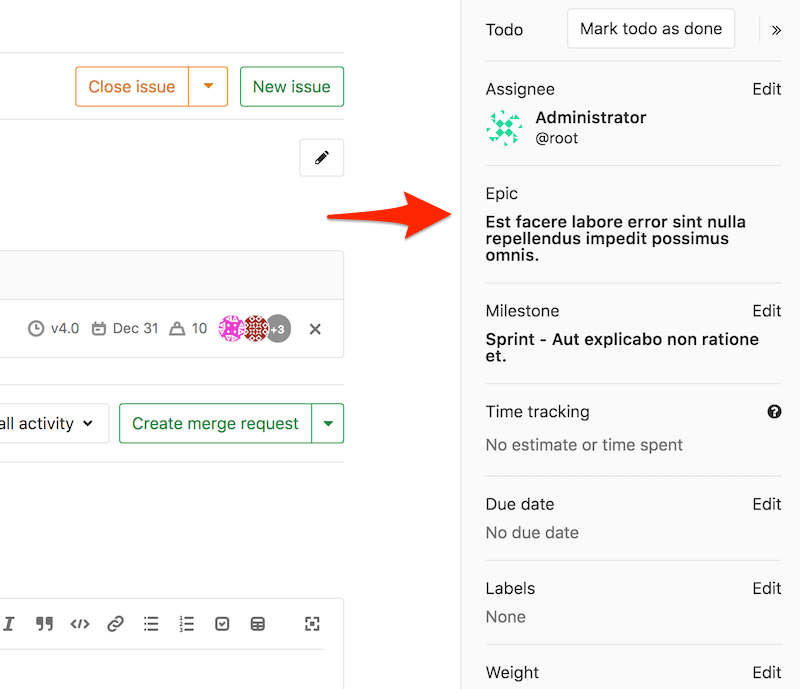 Epics let you manage your portfolio of projects more efficiently and with less effort by tracking groups of issues that share a theme, across projects and milestones. Once created, you will be taken to the view for that newly-created epic where you can change its title, description, start date, and due date. Click the plus icon (+) under the epic description. Paste the link of the issue (you can hit Spacebar to add more than one issues at a time). Any issue belonging to a project in the epic’s group or any of the epic’s subgroups are eligible to be added. To remove an issue from an epic, click on the x button in the epic’s issue list. Note: When you add an issue or an epic to an epic that’s already associated with another epic, the issue or the epic is automatically removed from the previous epic. Introduced in GitLab Ultimate 11.7. Paste the link of the epic. Any epic that belongs to a group or subgroup of the parent epic’s group is eligible to be added. To remove a child epic from a parent epic, click on the x button in the parent epic’s epic list. Inherit a dynamic value called “From milestones”. If you select “From milestones” for the start date, GitLab will automatically set the date to be earliest start date across all milestones that are currently assigned to the issues that are attached to the epic. Similarly, if you select “From milestones” for the due date, GitLab will set it to be the latest due date across all milestones that are currently assigned to those issues. These are dynamic dates in that if milestones are re-assigned to the issues, if the milestone dates change, or if issues are added or removed from the epic, then the re-calculation will happen immediately to set a new dynamic date. Introduced in GitLab Ultimate 11.10. If your epic contains one or more child epics which have a start or due date, then you can see a roadmap view of the child epics under the parent epic itself. Drag and drop to reorder issues and child epics. New issues and child epics added to an epic appear at the top of the list. Note: To delete an epic, you need to be an Owner of a group/subgroup. When inside a single epic view, click the Delete button to delete the epic. A modal will pop-up to confirm your action. Deleting an epic releases all existing issues from their associated epic in the system. You can always reopen it using the reopen button. If an issue belongs to an epic, you can navigate to the containing epic with the link in the issue sidebar. If you have permissions to close an issue and create an epic in the parent group, you can promote an issue to an epic with the /promote quick action. Only issues from projects that are in groups can be promoted. An epic is created in the same group as the project of the issue. Subscribers of the issue are notified that the epic was created. Group labels that the issue already has. To search, go to the list of epics and click on the field Search or filter results…. It will display a dropdown menu, from which you can add an author. You can also enter plain text to search by epic title or description. When done, press Enter on your keyboard to filter the list. Each option contains a button that can toggle the order between ascending and descending. The sort option and order will be persisted to be used wherever epics are browsed including the roadmap. If you have access to view an epic and have access to view an issue already added to that epic, then you can view the issue in the epic issue list. If you have access to edit an epic and have access to edit an issue, then you can add the issue to or remove it from the epic. Note that for a given group, the visibility of all projects must be the same as the group, or less restrictive. That means if you have access to a group’s epic, then you already have access to its projects’ issues. You may also consult the group permissions table. Comments: collaborate on that epic by posting comments in its thread. These text fields also fully support GitLab Flavored Markdown. Click “Comment” and your comment will be published. Click “Start discussion”: start a thread within that epic’s thread to discuss specific points. You can award an emoji to that epic or its comments.